The cartridge body of the ML140HE contains an abundance of new functional electrical features for high output with maximum fidelity. The bifold-paraflux coil-core has pre-aligned two-layer folded pole pieces with parallel flux laminations to provide greater efficiency of energy transfer and maximum channel separation. The architecture of the internal frame interlocks to produce a completely rigid, non-resonant substructure. The cartridge body will never wear out or cause deterioration of the sound. The true humbucking coil configuration results in maximum hum cancellation. The non-corroding gold-plated terminal pins ensure continuity of the signal path. 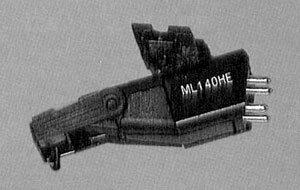 Shure ML140HE / ML-140HE owners manual, service manuals and schematics are for reference only and the Vinyl Engine bears no responsibility for errors or other inaccuracies. The PDF files are provided under strict licence. Reproduction without prior permission or for financial gain is strictly prohibited. This website is not affiliated with or sponsored by Shure.